Growing up, we would all look forward to dinner. Mom would cook budget meals. Mom knew how to make a meal stretch. I've always liked sauerkraut and sausage. Mom said, “this was food for the poor”. I remember mom saying one word “ dinner”, and we all run through the door. We was tired from playing hard and hot. But the smell of the food cooking made you hungry. We couldn't wait for dinner. I know a lot of folks don't like sauerkraut. Some folks don't even like the smell of sauerkraut cooking. 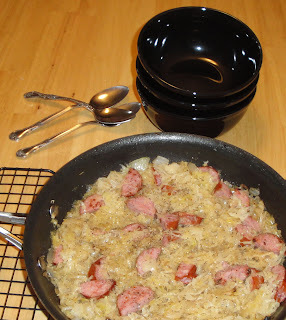 I bet a lot of you went running after seeing the name “sauerkraut” in the recipe title. And I bet other folks loving the recipe. What was your favorite poor folks food growing up?... comments below. You are welcome to chat with each other in the comments. If you have any question, please feel free to comment or send me an email. I'm happy to help. :-) You can find my email address at the top of this page. Do you like Christine's Pantry? Subscribe to Christine's Pantry recipes by email, never miss a post. You will receive an email from Christine each time I post a recipe. Occasionally I will send out a request for submission to email subscribers so that my friends and fans can share their heritage recipes, photo(s) and stories with us. Your email address is never shared or seen by anyone other then Christine. To subscribe, please go to subscribe by email (on the sidebar) and enter your email address and click submit, it's free and easy. In a skillet, heat oil over medium high heat. Season sausage with salt and pepper. Add sausage, cook about 8 minutes, turning once. Remove sausage from pan and place on paper towel lined dish. Reduce heat to medium. Add onions to skillet, scraping up brown bits from sausage, cook until tender. Return sausage to skillet, add sauerkraut and stock. Stir well. Simmer about 18 to 20 minutes. Keep an eye on it, you may need to add more stock to keep it moist. Enjoy! I am a sauerkraut lover! I put tart apples in mine for an extra layer of flavor. My favourite poor man dish is Chinese steamed egg custard seasoned with soy sauce and sesame oil. I'd this at my friend's place and her family was poorer than mine. I couldn't forget the lovely taste of her mum's cooking. Best food comes from the simplest form! I LOVE this type of dish. I made pork loin, sauerkraut and smoked sausage in the crock pot...along with some others - but I always eat the smoked sausage and leave the pork for everyone else! Nicely done! My family and I do enjoy sauerkraut very much actually. I don't know if this counts, but I love when my mom uses up the day old Italian bread and makes little pizzas out of them! It's my favorite treat actually! Hope you and yours have a marvelous holiday, Christine! I have to admit I'm not a fan. My husband however, is a big enough fan for both of us!! I just may have to try my hand at good sauerkraut. Being German, I really should try to master this!! I'm a HUGE fan of sauerkraut! I want to make this with veggie sausage! For me, I cannot imagine pork chops without sauerkraut. Gotta have it. Also, when I make stufed cabbage, I always layer the cabbage rolls with sauerkraut. I love the smell of it, even if it's strong...no worst than the smell of broccoli, or cauliflower! Great dish for the 4th celbration, Christine! Hey y'all, thank you very much. I hope y'all having a good 4th of July. It seems that poor that is 'supposed' to be for the 'poor' is terrific - comforting and hearty. This sounds really good. Mmm-m! One of my favorite dishes! You could try improve it, that is you can put it into oven with a glass of red (dry or semi-dry) wine, some smoked bacon (optional), some dill and thyme (better fresh) and a couple of tablespoons of tomato paste...yummy! I've never been a fan of the smell of sauerkraut but things cooked in sauerkraut have a surprising way of turning out very, very good. I grew up eating something similar to this. Sauerkraut is still one of my favorite foods. the only meat i eat is chicken...lol. i didn't even know of sauerkraut until right not when i read your post. it sounds interesting. i really like the sound of your seasoning. never eaten sauerkraut before, just curious how the taste like. What kind of stock do u use?